* Invalid Registry Data type: "disable performance counters"
Has used shutter for several month with very excellent results to turn off the monitors on time. 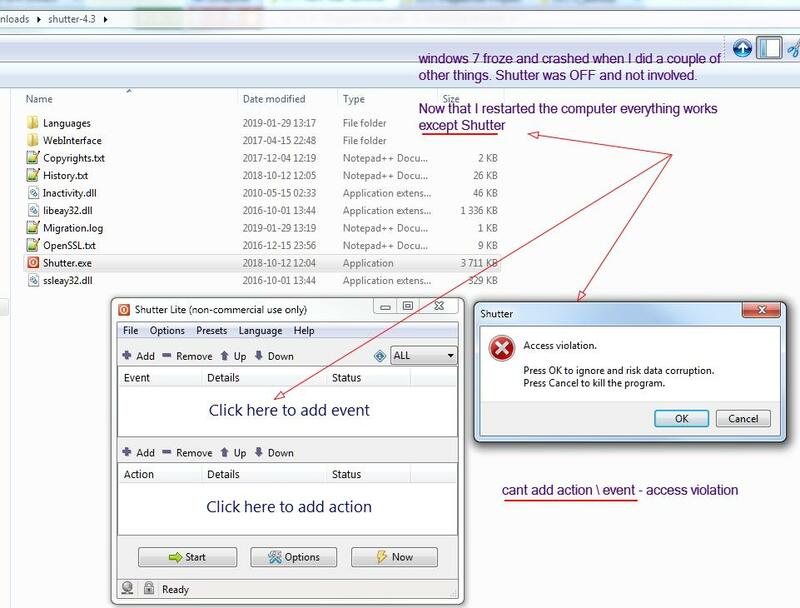 Now that I restarted the computer everything works except Shutter..
which shows error message on startup and error reporting box (access violation) when I am adding an event. See pictures below. Thank you for a detailed report! First, please try the latest development version, i.e. Shutter 4.3.0.2 Beta. The checking of the performance counters has been moved out of the application initialization stage and into the event frame show stage. This should avoid the crash of the application when the performance counters are broken. Try navigating to the Hard Disk Usage event configuration, this is where that check is performed now. It appears that your performance counters got broken/corrupted, probably as a result of your recent system crash. Note that performance counters are currently used only by the Hard Disk Usage event. So if you don't need this event, you can just continue using Shutter without fixing the performance counters. Seems like this new release are working just fine.. exept for.. This event still give me; Invalid Registry Data type: "disable performance counters"
* It appears that your performance counters got broken/corrupted, probably as a result of your recent system crash"
* Try navigating to the Hard Disk Usage event configuration, this is where that check is performed now"
if I dont fix/rebuild my performance counters.. Does this make my FDE Encrypted Hard Drives (SSD/SAS) and Raidcard LSi-9361-8i or Windows-7 itself unstable? It is hard to say what the effects might be. Anything can happen when a file system corruption occurs, but, you may also never experience any other issues. You should check the file system for integrity, and get Windows to check its system files too. As for the performance counters, you should at least run the "wmiadap.exe /f" command in an attempt to refresh performance counters data. You should check the file system for integrity, and get Windows to check its system files too. I Renamed the registry key "Disable Performance Counters"
* How I Reproduce the Error in my Win7 / Raid-10 Environment . 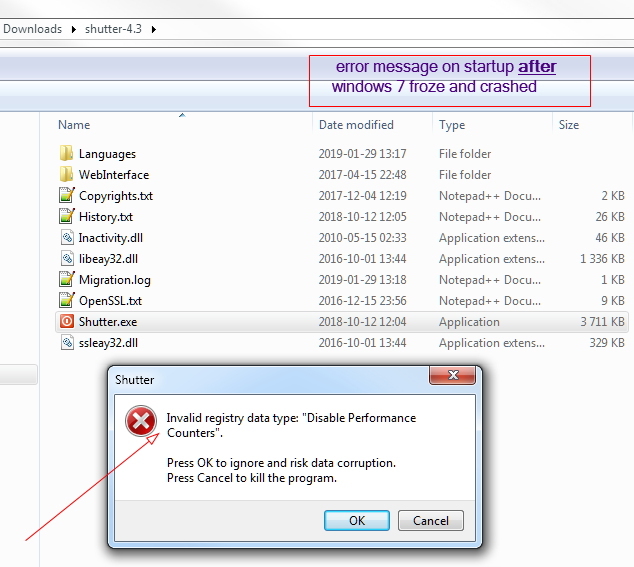 * Rename the key to ".disable performance counters_offline" with value "0"
Hey, Does shutter contain a bug? because, the value "0" and key "disable performance counters"
I reviewed the Event Viewer very carefully and found absolutely nothing of value for the Shutter to scream out loud. I have tried to Reproduce the error in several other programs that use hard disk information in addition to shutter. Without result. Performance Counters seems to work as they should in all other programs, except when I activate HDD event in shutter v.4302 & below. I executed these commands without positive results. lodctr /R: Before I recreated\rebuild the Performance Counter with command "lodctr"
I fired up the remote virtual registry and searched for The key "Disable Performance Counters"
lets give it a shot..
Well, what was the cause of this? probably added the KEY "Disable Performance Counters" Value "0" to Force performance counters to work. Invalid Registry Data type: "disable performance counters"
I found a couple of threads that might be of interest..
full syntax of this command, type diskperf /? 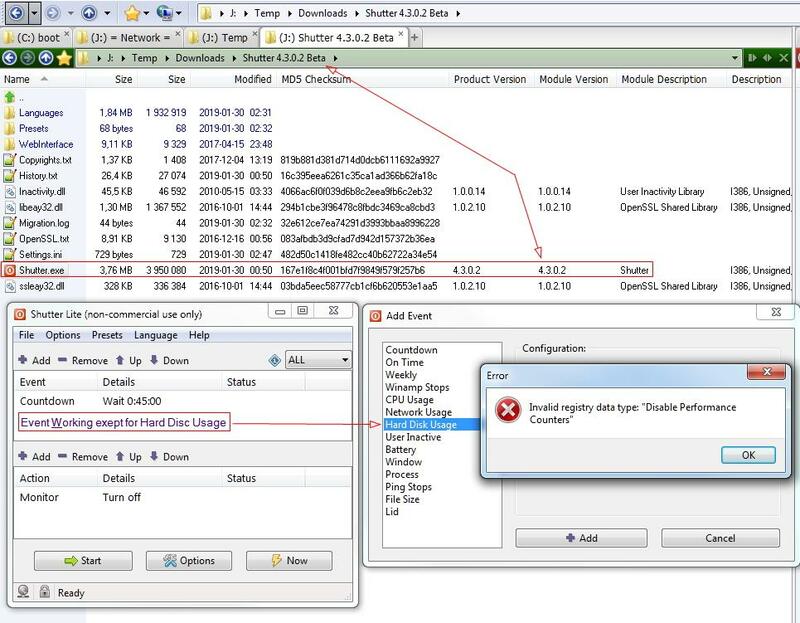 The Extensible Counter List tool, or Exctrlst.exe. There is a subtle inconsistency in your registry entries. The data type of the "Disable Performance Counters" value is expected to be REG_DWORD (integer), but it your case it is REG_SZ (text) for the "PerfDisk" key. That is in accordance with the Microsoft's documentation on Disable Performance Counters. You can also see from your screenshots that the rest of "Disable Performance Counters" values are of type REG_DWORD, except for the "PerfDisk" key. Shutter attempts to read the value as an integer, but the returned data type does not match the expected type, so it raises an exception. If this value was created by a 3rd party application, then I guess it is at fault for inappropriate use of the registry. This raises a question - does "Disable Performance Counters" value with REG_SZ data type has any effect for the operating system, or perhaps it is ignored due to incorrect data type? It is not clear how Shutter should handle such case. It currently raises an exception due to incorrect data type, but it could silently ignore the value instead. If this value was created by a 3rd party application, then I guess it is at fault for inappropriate use of the registry. would be REG_DWORD (integer) or REG_SZ (text). I assumed that it would be REG_SZ in the "PerfDisk"
"Disable Performance Counters" value "0" REG_DWORD (enable) is correct Registry Value Type at "PerfDisk"